The Australian dollar has become the third currency, along with the US dollar and the Japanese yen, to trade directly with the Chinese yuan. The move is seen as a significant step in China's push for a more international role for its currency. 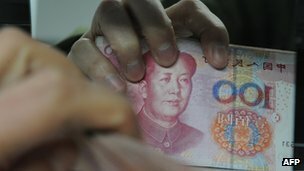 Beijing is trying to promote the yuan as an alternative to the US dollar's role as a global reserve currency. "The yuan is on its way to becoming fully convertible," said Stuart Oakley, managing director at Nomura. "This ties in with a trend that we have been observing for a some time. And being fully convertible is a pre-condition to becoming a reserve currency." Reducing dollar dependence? 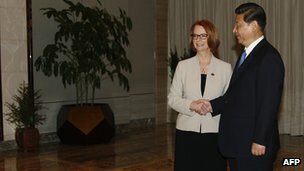 China is the biggest buyer of Australia's natural resources such as iron ore. But with no mechanism in place to directly convert between the Australian dollar and the Chinese yuan, the two countries have long used the US dollar as a trading currency. Indeed, most commodities and commodity futures are priced using the US currency. With the new deal coming into effect, there is likely to be an increase in Australian and Chinese firms agreeing prices in either of their currencies. "There is no international law that dictates that all contracts must be agreed upon in US dollar terms," said Mr Oakley. "All that the companies have to do is pick up the phone, talk to each other, and decide what currency they want to use." However, as yet the deal does not pose a threat to the US dollar's dominance, in spite of its intention to indicate China's resolve for a global role for its currency. "While some contracts may be drawn up in other currencies, international pricing and trade of commodities will continue to be done in US dollar terms," said Michael McCarthy, chief market analyst as CMC Markets in Sydney. "There is no reason why that would change at this stage." Reducing costs The deal is, however, expected to reduce the cost for businesses in China and Australia when they deal with each other. Until now, companies had to first convert their respective home currencies into the US dollar, before exchanging into the yuan or the Australian dollar. That added an extra layer of currency conversion, which increased their operational costs. A direct conversion of the two currencies is likely to help firms save those costs. At the same time, analysts said the agreement may also help further boost bilateral trade between the two countries. "Once you have directly convertible currencies, it becomes a lot more easier to do trade," said Jonathan Barratt, chief economist at Barratt's Bulletin in Sydney. Cautious moves? China has been loosening its grip on its currency as part of its attempts to internationalise the yuan. Last year, it said that it will set up a special business zone in the southern city of Shenzhen to experiment with the yuan's convertibility. The zone is scheduled to be established over the next eight years, with construction set to start this year. China also widened the range in which the yuan was allowed to trade against the US dollar, from 0.5% to 1.0% on either side of a daily rate set by the People's Bank of China, the Chinese central bank central bank. All these moves have raised hopes that the Chinese government intends to press ahead with plans to fully liberalise its currency in the coming years. However, some analysts said that while the deal indicated that China was pressing ahead with its plans, it was unlikely that Beijing would rush to achieve that goal. "They will only allow full convertibility of the yuan when they are confident that they have the structures and policies in place to deal with any currency fluctuation and its impact on the Chinese economy," said Mr McCarthy of CMC Markets.